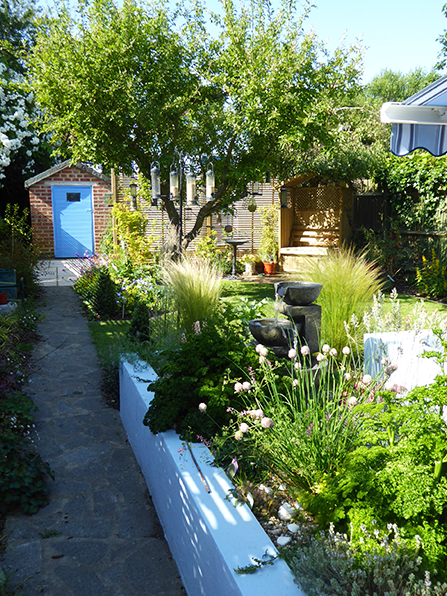 Here is a small rear garden that had become out of control and overgrown, but that offered a haven for birds and wildlife. The owners wanted to retain this quality, while improving and updating the site. At the end of the garden an artist’s studio and shed were to remain, along with the existing patio. The design used diagonals to provide larger planting areas and a good sized lawn, with another small paved area. A built-in seat was created on the patio, with a large raised bed for easy gardening, complete with attractive water feature and herbs. An arbour and trellis partially screens the shed and studio. Although several trees were removed, the remaining apple tree is now an attractive feature and supports the many hanging bird-feeders. The new garden is much easier for the owners to maintain, and the birds love it too!